Years ago, I was sitting in my parents home in Nebraska. My father and I had just had a heated exchange about an issue of the day. I knew he was mellowing with age because he didn't have to have the last word and simply withdrew from the conversation. As I sat there across from him, I noticed that his feet were turned inward. He always appeared pigeon toed as he sat. Then I happened to look at my own feet and saw they were turned in as well. At that age, it was a moment of stark horror for me. I began to wonder what else I had inherited from him. What else was there influencing me in subtle and unknown ways? There was a high school teacher who shaped me as well. It wasn't nature, but nurture. He was able to sense a gift I had that he could strengthen. In doing so, he moved me out of some of my self destructive behaviors into more constructive ones. It's doubtful I could have articulated his contribution to my life at the time, but it's quite apparent to me now. I often wondered how the world would be different if a teacher like mine had been able to reach Lee Harvey Oswald when he was younger. Would President Kennedy have been assassinated? Would we have had so many killed in Vietnam? How might a few acts of kindness and a little mentoring changed human history? Often we aren't aware of the influence on us of those around us. We aren't often aware of how we influence others. Those influences are only revealed in time; perhaps never. I'm thinking about all of this because of the book I'm reading. It's The Hour I First Believed by Wally Lamb. Part one of the book is titled "Butterfly." It refers to the "butterfly effect" in chaos theory. 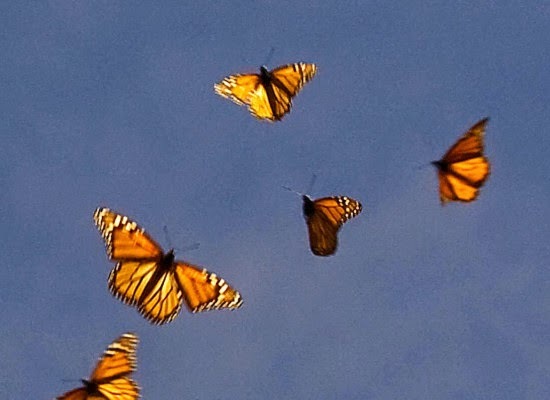 As described by Wikipedia, "In chaos theory the butterfly effect is the sensitive dependence on initial conditions in which a small change in one state of a deterministic nonlinear system can result in large differences in a later state." In other words, the exact details of a hurricane may well be influenced by the flapping of the wings of a butterfly weeks earlier. The book doesn't spend a lot of time focusing on butterflies. The primary focus is the Columbine School shooting in Littleton, CO. I remember the event well. It put me out of commission for two to three days. Our daughter was teaching in the Denver public schools at the time so it made me doubly disturbed. Also, several of us were doing conflict resolution work in the public schools. We were convinced such killings didn't need to happen. We were implementing programs that helped young people with their conflicts and hates. Schools only needed to provide more time and energy for helping them build conflict resolution skills, become aware of their biases and develop programs of peer mediation. I haven't finished the book. There are 729 pages and I'm on page 412. But it's quite clear that the butterfly effect is at work in the story and what happens at Columbine has an impact far into the future, exponentially in some instances. If only we could learn that it's all related. Contrary to seeing everything centered in chaos, creation is one harmonious whole. It functions like a great symphony with more instruments and voices than we can imagine. What happens in one part of the orchestra effects what happens in another. And if some voices are out of harmony, the music isn't that great. How you and I behave in one circumstance for good or evil has consequences someplace, maybe everyplace. I'm sure those Columbine shooters had no idea they would make me temporarily dysfunctional in Brookings, SD when they went on their killing spree. But from what we know of their utter rage and intentions, it would likely make them quite happy. A good friend in Mexico was telling me about the way his country is tied economically to the U.S. He said when the U.S. coughs, Mexico comes down with pneumonia. Little do we recognize in our privileged status that when Wall Street has to be bailed out, whole societies in other lands collapse. When we put shredded coconut in our cake in the U.S., children in India fall ill for want of tender coconut milk. It's all related. Part of our problem in the U.S. is our individualism. Instead of working to moderate ego we try and enhance it. Instead of thinking about others first, we succor a "me" generation. Instead of recognizing the necessity of social salvation, we focus on individual salvation. We don't often recognize the focus on self has a butterfly effect. In time, those flapping wings can either cool a burnt brow or blow the other away.